I am more than happy to review this ESV Wide Margin Reference Bible. 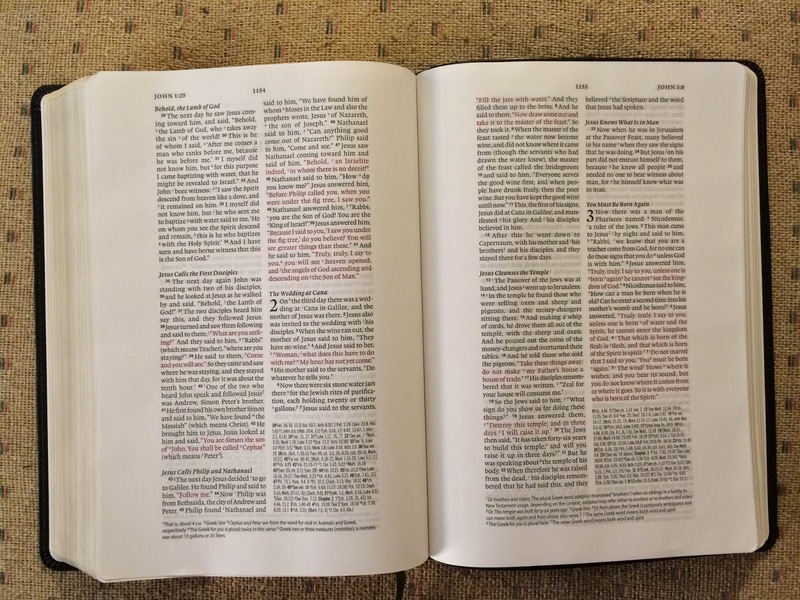 The other day, I was looking at the new ESV Reader's Bible and I happened to mention that although the ESV hasn't been my preferred translation, that I might would read from it more having that edition. I feel the same way about this one. I currently have two NASB Bibles which are considered 'wide-margin' Bibles and I will be comparing this ESV Wide Margin Reference Bible to those. I love wide margin Bibles, in fact, they are essential for me. I have 'Study Bibles', but I mostly use them for referencing the notes. 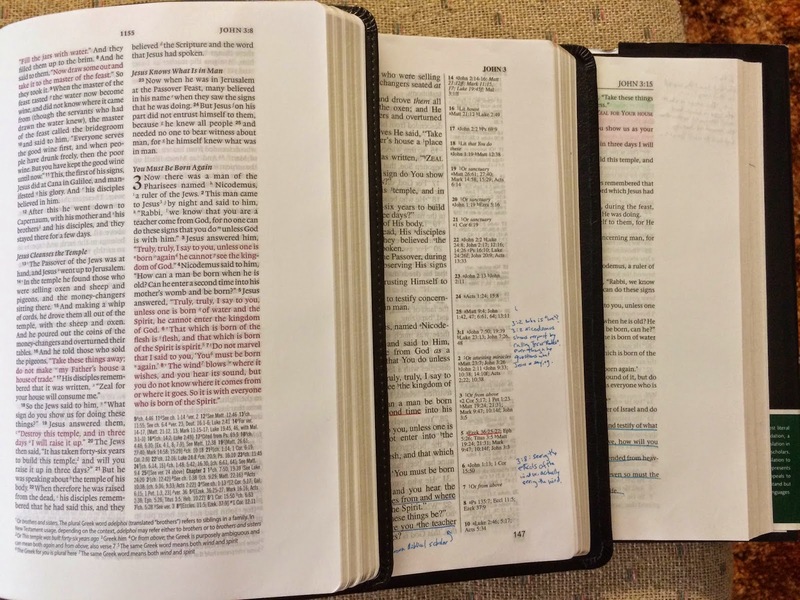 My study Bibles aren't 'Study Bibles' but are wide margin Bibles where I can make my own notes. I have been known to transpose notes from other 'Study Bibles' or commentaries, add my own notes, add my own cross references and even draw diagrams and pictures. I love need that extra space! 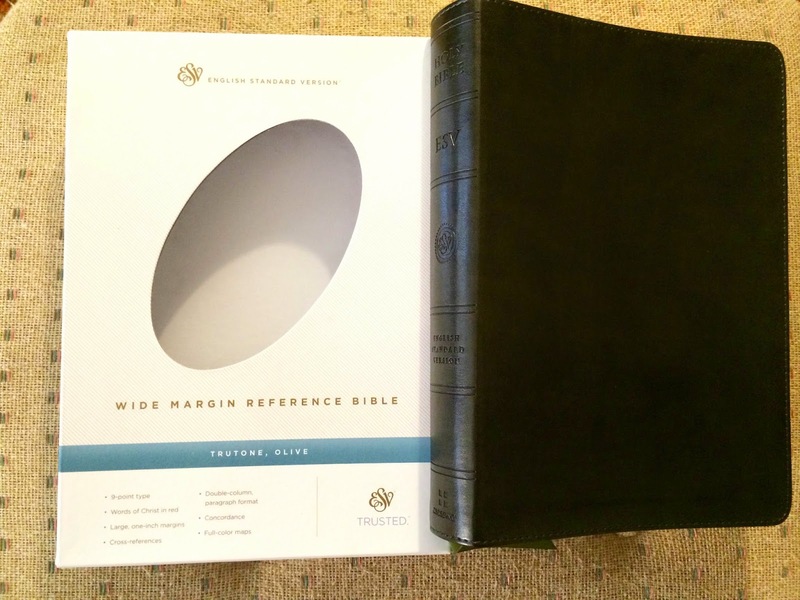 This ESV Wide Margin Reference Bible features the traditional Double-Column text layout. The text is a very readable 9pt. font and as the name implies, there are 1" Margins. Cross-references are located at the bottom of the right-hand column and footnotes span the bottom of the page. I like this layout better than the center column cross-reference style (or even my Side-Column reference NASB which I'll show you in a moment). I think it's cleaner, and the Bible feels more like a plain text Bible until you go looking for the cross-references. I know many like Mark Bertrand, for example (you can see his review of the Top Grain Leather version of this edition here) prefer a single-column, paragraphed layout. Although I've been dealing with two Bibles that have a single column with a verse layout for my wide margins, I love my ESV Study Bible (Personal Size) and the new ESV Reader's Bible which has the Single Column Paragraph layout, so I can understand where Mark comes from; it's great for reading. One thing I've disliked about the wide margin Bibles I already had was the single column layout. Why? It's not so much the column, but underlining. I find it easier to underline a narrower column than the wider single column (even with a ruler). I also dislike verse layout for most instances, but that's been all I have been able to find, so I'm thankful this has a paragraph layout. 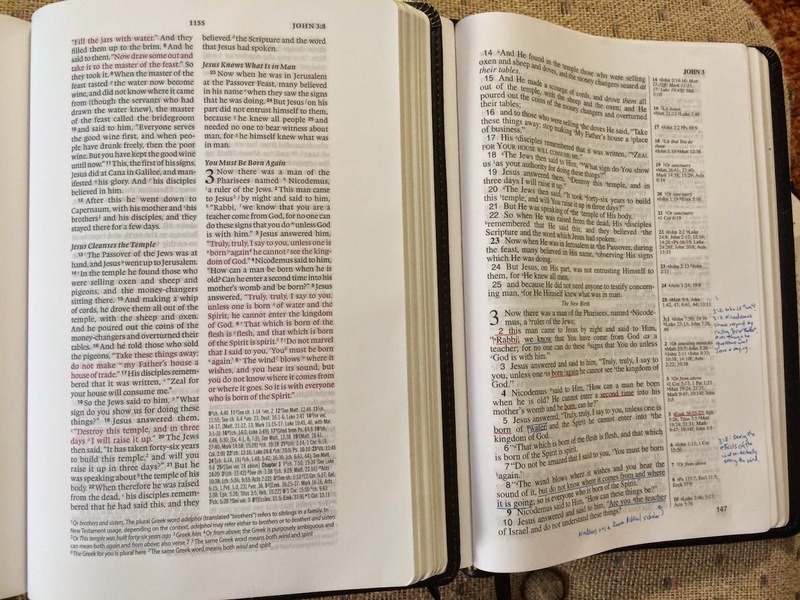 Being a double-column, there is more of an inner margin than there is in either of my other wide margin Bibles. The paper in this Bible has good opacity and line matching. This Bible is a Red Letter edition, which is something I have no strong feelings about either way as long as the text is readable and not a faded pink-red-orange color. 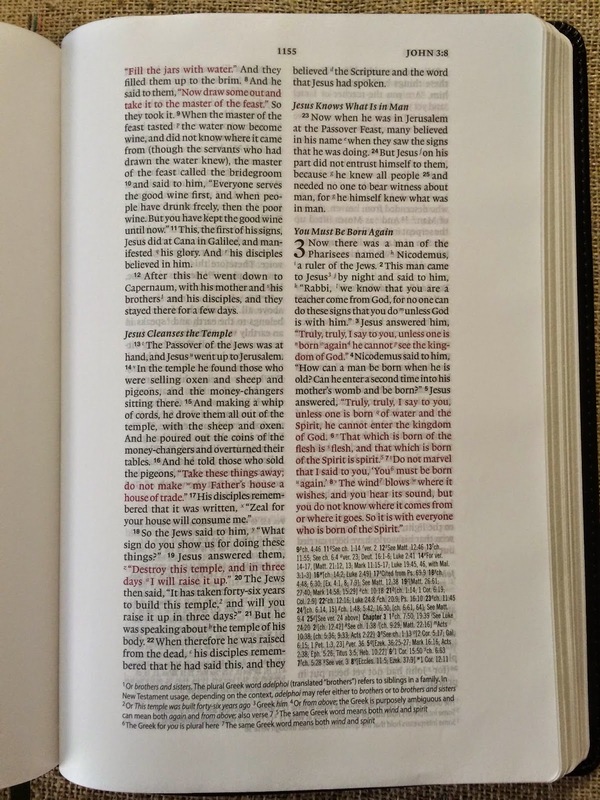 The red printing in this Bible is just fine, and is actually red, and quite readable. I was sent a copy that is bound with the TruTone binding that is stitched around the edges. TruTone is Crossway's imitation leather. My ESV study Bible is TruTone, and honestly I like Crossway's TruTone very much. I would generally rather have it than a Bible stamped 'Genuine Leather'. In my opinion, unless you get into Top Grain Cowhide, Calfskin or Goatskin, many of the Imitation Leather covers look and feel better than 'Genuine Leather' (which is usually pigskin). 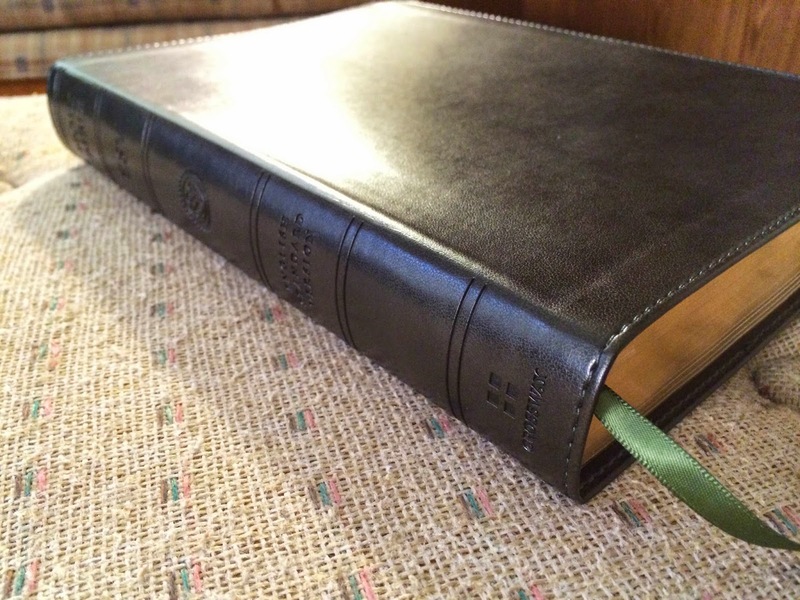 What's more important than the material of the cover is the fact that this Bible has a sewn binding, opens flat and has just the right balance of limpness/stiffness for one handed reading. Usually I'm pretty conservative with Bible colors, and this Bible was marked "TruTone Olive". Now, I would have never ordered a green Bible sight-unseen (even though green is my favorite color), but I love the color of this Bible. The Olive is a very dark olive green that looks nice. The pages are gilded in gold and the ribbon marker is a lighter shade of olive. This is a very nice looking Bible! The Bible has a 61 page, three-column concordance that lists 2400 entries, cross-references and 8 pages of maps. It's worth noting that the maps aren't printed on shiny paper, and I think this is a nice touch for improved readability. I also want to mention that this Bible has a lifetime guarantee from Crossway. There is a single ribbon marker, and the only thing I would wish for is a second ribbon. 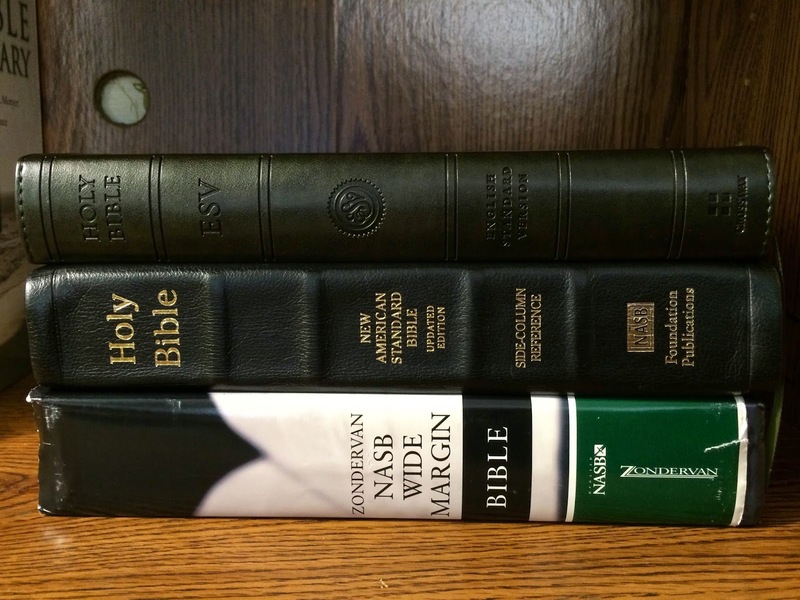 From top-to-bottom: The ESV Wide Margin, NASB Side-Column Reference by Foundation Publishers (Calfskin) and a Zondervan NASB Wide Margin (Hardcover). I just want to close by restating just how much I like this Bible. Although the NASB has been my preferred translation, I've always liked the ESV as well, and honestly having this Bible along with the Reader's Bible, I'm certain I will be reading the ESV more often. I have really enjoyed both of these Bibles. At a retail price of $59.99 (less through online discount retailers or Crossway Impact) I can heartily recommend this Wide Margin Reference Bible, especially if you have never experienced how awesome a Wide Margin Bible is! There is nothing like being able to create your own personal study Bible! Although Crossway provided this Bible to me for free to review, I was not in any way required to provide a positive review. Thanks, Jayson. Think I might go for the genuine leather if it's the same layout - not keen on covers that are too flimsy. This is the ISBN of the Genuine Leather -- 9781581351590 - I hope it works out well for you. Well I bought the Genuine Leather - really quality product and I love the margin space. Thanks once again for your help! How does this Bible look now after a year of use? Is the binding tight? What does the cover look like? How does it hold up with note taking? Enjoyed your article. I ended up giving this TruTone copy away to a friend -- I decided I didn't like the green after all, but I did purchase a black Genuine Leather copy. I love it. It has held up fine with the note taking -- it's a sewn binding and that has given me no trouble either. I checked w/ my friend and he indicated that the TruTone cover is holding up just fine also. 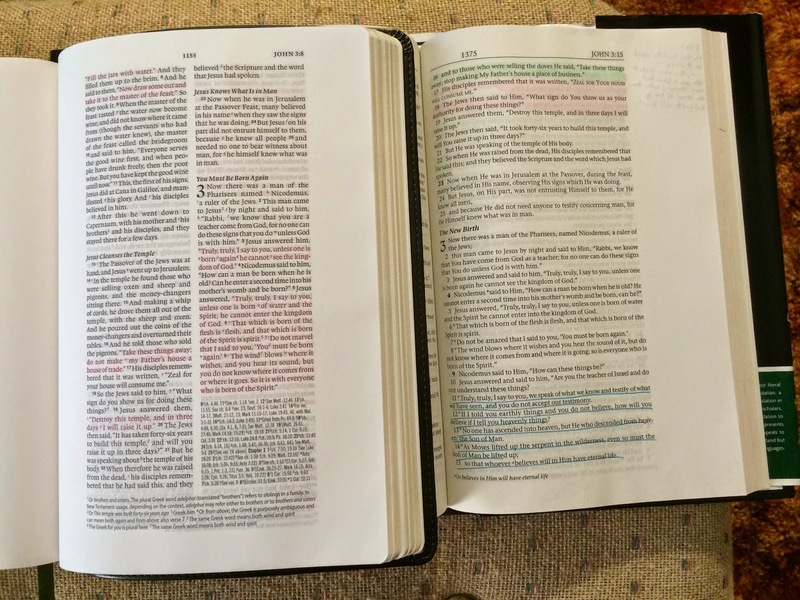 I'm seriously thinking about picking up the ESV to replace my old Zondervan NASB Wide-Margin, so I appreciated your side-by-side pictoral comparisons. The ESV margins look almost as wide as the Zondervan. Is that really the case, or is that a trick of the perspective. I take a LOT of notes, so I'm trying to get the most space I can. Thanks in advance!